[ The Oxford Architectural Society. ] Bookplate of the Society, by the wood-engraver Orlando Jewitt, on mount signed by secretaries John Portal and Robert Wilmot. A scarce piece of Oxford ephemera. The Society for promoting the Study of Gothic Architecture was founded in 1839; renamed the Oxford Architectural Society in 1848; renamed the Oxford Architectural and Historical Society in 1860; merged with The Oxfordshire Archaeological Society in 1972 to become The Oxfordshire Architectural and Historical Society. In good condition, printed in black ink on a 15 x 11 cm piece of white India paper, laid down on a 22 x 18.5 cm grey card mount. At the foot of the design, in tiny letters, is engraved 'O. JEWITT. | DEL. [Female suffrage; printed pamphlet.] Nineteenth Annual Report of the Society for Promoting the Employment of Women, in connexion with the National Association for the Promotion of Social Science, April, 1878. 29pp., 8vo. Containing: list of officers (pp.3-4) 'Rules' (p.5), 'Annual Report' (pp.6-18), 'Donations and Subscriptions' (pp.19-22, headed by 'Her Majesty the Queen' with a £50 donation and ten guinea subscription), list of 'Life Members or Donors of £5 and upwards' (pp.23-28), and 'Cash Account, March 25th, 1878' by the auditor Joseph Biggs (p.29). Topics in the report include 'Plan Tracing Office, | 42, Queen Anne's Gate', 'China Painting', 'Engraving on Wood', 'Clerks and Book-Keepers' and 'Commercial School for Girls, | 41, Regent Square'. Run of six printed reports of the British and Foreign Blind Association for Promoting the Education and Employment of the Blind, London. London: Bowles & Sons, Printers, 18 & 19, Sherborne Lane, E.C. 1907 to 1912. The six issues, loose. Each with its printed wraps (the first two years light brown, the other four green). Ranging in size from 40pp., 12mo (1908) to 76pp., 12mo (1912). 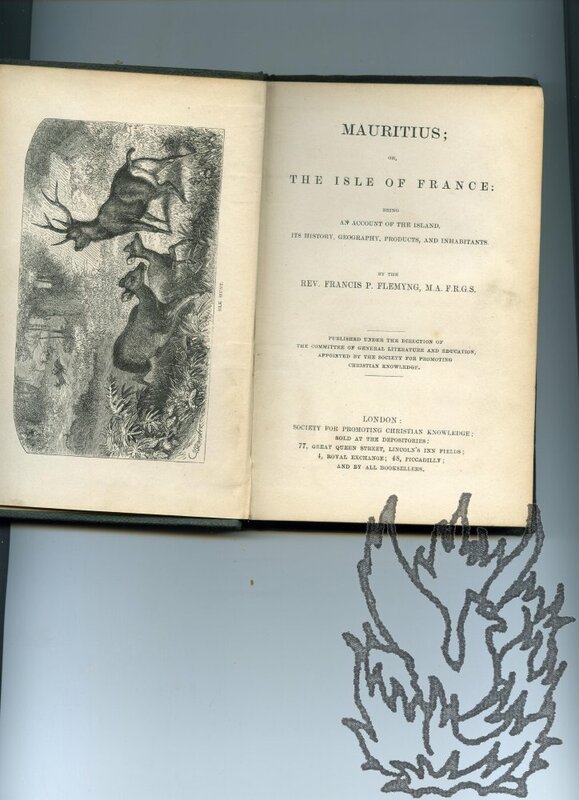 Last three issues with frontispiece drawing of the Association's building in Great Portland Street. In good condition, on lightly aged and worn paper. Each issue with stamp, shelfmark and label of the Board of Education Reference Library, London. All with material relating to the Braille Alphabet (and in some cases the Braille Musical Alphabet) at rear. Scarce: no copies of any of the Association's reports on COPAC. Four small children's stories published by the Society for Promoting Christian Knowledge, bound together in wraps with their original title pages: 'Tommy and Mary', 'The Rector's Brook', 'Dobbin; or, The Discontented Donkey', 'The Little Missionary'. All four published by the Society for Promoting Christian Knowledge, London, and printed by Printed by James Truscott and Son, Suffolk Lane, City. All four undated [1870s]. 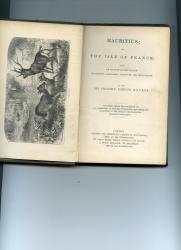 All four stories 16mo, and each with a frontispiece included in the pagination. ONE. 'Tommy and Mary. A Book for the Very Little Ones.' 17pp. TWO. 'The Rector's Brook: A Story for Little People.' 32pp. THREE. 'Dobbin; or, The Discontented Donkey.' 30 + pp. FOUR. 'The Little Missionary. A Tract for Children.' 11pp. Stitched into printed wraps, with the front cover coloured blue and the rear pink. Aged and worn, but complete and tight. 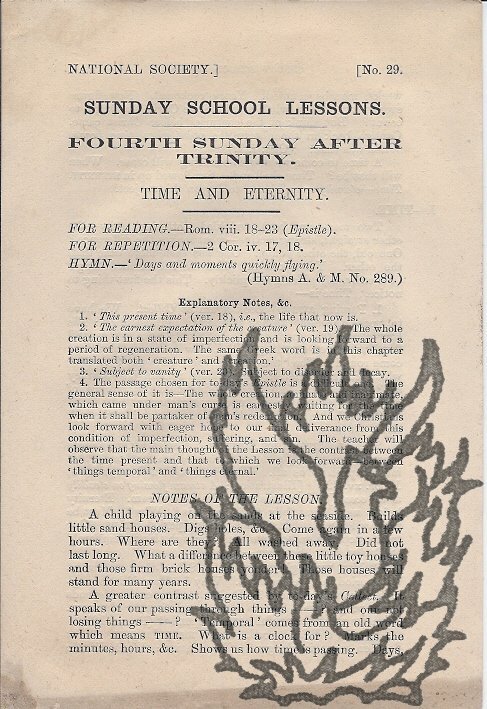 Handwritten in a contemporary hand on the reverse of two frontispieces: 'Kilndown Lending Library'. 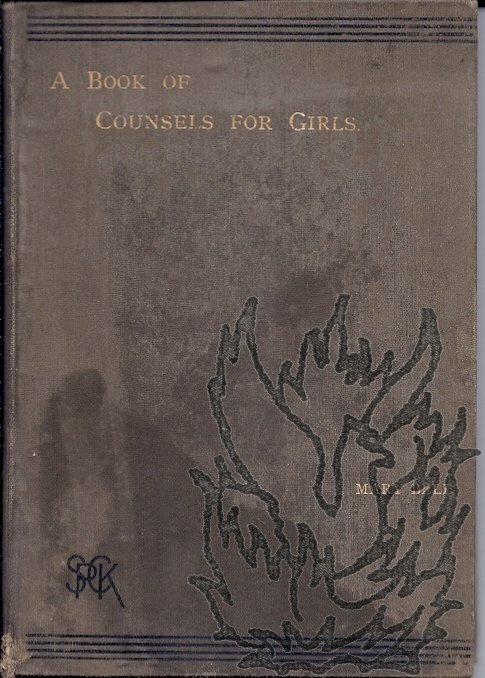 A Book of Counsels for Girls. Published under the direction of the Tract Committee. 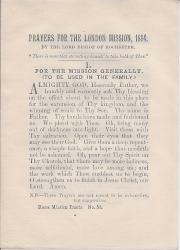 12mo, 96 pp, followed by four-page SPCK catalogue (with first page listing works by the Rev. F. Bourdillon). Text clear and complete. In original olive cloth binding, gilt, stained with damp. Damp damage at rear leaving light staining to corners of last few leaves and catalogue, together with heavier damage to rear endpapers. Traces of Library label on front pastedown. Cloth faded, worn and stained. 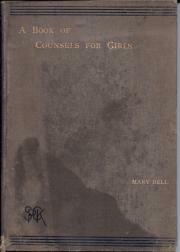 Bell explains in her preface that 'The poor are excellently well provided with all sorts of books of counsel and help. 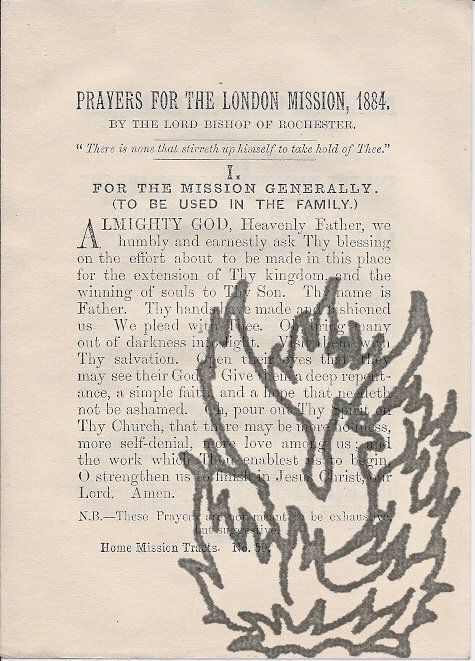 [Printed] Prayers for the London Mission, 1884, Home Mission Tracts, no.53. National Society, No. 29. Sunday School Lessons. Fourth Sunday after Trinity. Four pages, 12mo, edges dusted, mainly good, not bound. No copy found on COPAC (one with similar title said to be at Cambridge is not this). The first five issues of 'The Saturday Magazine'. The five issues are each eight pages long and octavo. All five issues unbound, and stabbed. All good, though lightly aged and with some wear to extremities. 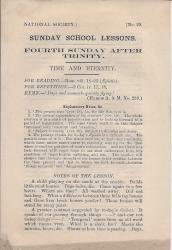 An improving publication, produced 'Under the direction of the Committee of General Literature and Education, appointed by the Society for Promoting Christian Knowledge'.